Sharon Corr tells Barry Egan how she beat anxiety to find her voice again. Her gig last September at Dublin’s Sugar Club was, perhaps, one of the shows of 2014. With her sister Andrea, Andrea’s husband Brett Desmond, and her brother, Jim, sitting in the back row watching appreciatively, Sharon Corr gave the performance of a lifetime. She sang out of her skin. It wasn’t, however, always thus . . . There was a time, mercifully brief, when Sharon suffered a debilitating crisis of confidence in her singing. Sharon opened up to me about this time in her life after she performed The Mamas and the Papas’ Dream A Little Dream Of Me for the Windmill Lane Sessions on Independent.ie. The song, she says, was pivotal to her recovery. Circa 2009, Sharon Corr “started to be nervous and anxious, because I wasn’t performing at a level that I was used to performing at. I had a bad performance because I was severely sleep-deprived. And before I got on stage I would have been changing nappies,” she says referring to her kids, Cathal, born March 31, 2006, and a daughter, Flori, born July 18, 2007. “And I had just got off a plane and I had just shot a video. “So,” she continues, “when I had a bad performance It didn’t represent me properly and it was also to an audience of eight million people on radio. I felt I had humiliated myself. “When that happened, you have a fear of it recurring and that feeds upon itself. And the problem is that it becomes cyclical, and unless you admit there is something wrong, you have no chance of getting through it. Dream A Little Dream broke me out of that cycle,” she says. Sharon adds by way of explanation that when she was learning the violin as a young teenager in Dundalk, she just didn’t pick up the violin and go: ‘Now I’m a violinist!’ She went to lessons. 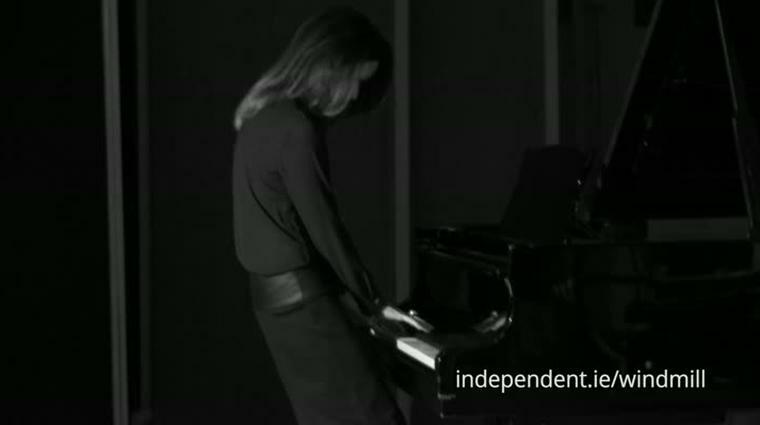 Sharon also did an emotional blitzkrieg of a performance of We Could Be Lovers at the Windmill Lane Sessions. The song, from her recent album The Same Sun, “takes the idea of infidelity. From the excuse you would make to yourself, ‘Does it have to be wrong? Does it have to be right?’ If you take morality out of the equation, then you can just go ahead and do it, can’t you?” she laughs uproariously. “Basically, it’s the idea from a woman’s point of view; that she can feel exactly the same way as a man — as in, she can be totally into someone she sees and she can imagine the idea of where this will go. Apart from look for a divorce, what did your husband Gavin say when you first played him the song? Tell me about your animal side, then.